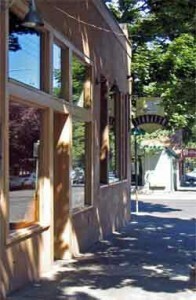 Located in the Italian restaurant row on NW 21st and Kearney, Serratto is a huge open space with soaring old growth timber beams. The well-designed lighting makes the earth tone room inviting – think modern rustic. Tables are clothed in crisp white linen; the seating ranges from comfortable leather to terrible hard wood that leaves you checking your back pockets to see what could possibly be making you so uncomfortable. On nice evenings, big open windows let the breeze blow through, and tables dot the sidewalk outside. Inside, the Vineria bar is a nice place to hang out while waiting for a table, or having a quick bite. Service is always attentive and knowledgeable. Every meal begins with an amuse bouche (little bites), which sets the tone for your evening. Bread and good sweet butter accompany every meal. The entrees can be kind of a strange mix. They start out Northern Italian, drift to Southern Italian, hit Morocco, and have some German influences. Some work, some don’t, some I didn’t try. Personally, I think they would do best if the menu stuck to Italian, but it does make things interesting. Italian meals usually start with a small order of pasta before moving on, but here they are far too substantial. It would be nice if they were available in two sizes. The first night I had the wild boar, braised in stock with red wine, tomatoes, and herbs, on penne with orange gremolata. The pasta was cooked perfectly and the boar plentiful making a hearty and satisfying dish that many people would enjoy. The price was just right for the substantial portion ($15.00). Spaghetti and tomato sauce with braised pork shoulder, hot Italian sausage, and beef meatball ($14.00) was very salty, the beef a bit dry. The sausage was quite good, but didn’t overcome the heavy salt. Roasted pork tenderloin on polenta cake with pancetta, balsamic braised chard, pine nuts, and raisins ($21.00) was fine but nothing terribly inspired. It reminded me of food at touristy restaurants in Northern Italy. Pan-seared scallops on a bed of lemon leek risotto finished with basil oil ($21.00) were quite good. The scallops were moist and perfectly cooked. Restaurant risottos make me a bit nervous, and when I saw the huge tower of it I was worried, but no need. This risotto perfectly cooked with an excellent mélange of flavors and nice little bites of lemon. A grilled ribeye of Cascade natural beef with garlic butter and spaetzle (little German noodles/dumplings) with mushrooms ($24.00) was a bit out of place. A nod to the beef lovers, this was perfectly cooked with robust flavor. I would have liked it on something a bit more regional but no big complaints. The nights I tried fish, overcooking seemed to be a trend. Seared halibut with Spanish romesco sauce on a bed of spicy lentils and spinach ($20.00) was a big disappointment. If these lentils are spicy then my grandmother was dynamite. The halibut was overcooked to the point of no return. An accompanying romesco was fine, but just average. The simply grilled wild salmon drizzled with citrus aioli ($20.00) was simply grilled, but also simply overcooked. I do like the minimalist approach, however. Once again the German spaetzle makes an appearance, this time with mushrooms $23.00. Out of the blue, the menu lists braised lamb with Moroccan spices over saffron basmati pilaf, mango chutney, and yoghurt raita $19.00. I didn’t try it but was a bit thrown to see it on the list. Finally, there is a vegetarian special every evening. The wine list is fairly extensive, with emphasis on Italian wine regions as well as some of the newer zones such as Sicily and Apulia. A few California and Oregon wines are thrown in. There are some interesting choices with about average markup. I’d like to see a few more by-the-glass choices. 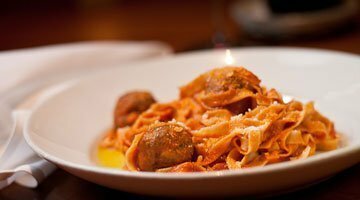 We’ve been to Seratto a couple of times (although not with the newest chef) since they’ve opened and it’s seemed a bit uneven and it’s never lived up to our memories of Delfina’s, which was our favorite of the Italian joints on NW 21st. Delfina’s was more bistro-style, but seemed more focused on the food than Seratto, and always made us happy, whether it was dinner for 2, 4, or 12. When did this chef take over? Seems like they may have gone through more than a couple in the last few years. The “new chef”, Thomas, has been there several years now. He was originally at Caffe Mingo, then went to Lucy’s Table, and took over Serratto a few months after co-chefs’ Adam and Matt left to open Tabla. Serratto has just reopened after closing for several weeks for a kitchen remodel. They have added a pizza oven and rumors of lunch service starting in spring are circulating. I just visited Serratto for brunch last weekend with a bunch of my friends and our breakfast was fantastic. Because there was eight of us I was able to sample a bit of everything. The biscuits and gravy with poached eggs are the best I have ever had, great job! My girlfriend oredered the French toast and devoured the gigantic portion, big thick cut brioche that is moist the way french toast should be! Everything we ate was great, and no wait like most places! I guess he replaced Thomas? Well we will all be comming back soon. I also have been impressed by Serratto. It has become one of my dad’s favorite lunch spots (he is super picky, being an east coast Italian), and I have the pleasure of tagging along from time to time. Last week 3 of us went, all of our salads were perfectly dressed, salted and portioned. My dining partners had pizza, which were great, albeit fairly straight forward. I had halibut, with fresh peas and fingerling potatoes, also perfectly portioned and delicious. I haven’t been for dinner in years, I’m not sure why, but I think I will make a point to go now. I feel like this is one of those great places I forget about since it isn’t new nor does it get a lot of local press. Serratto is the type of restaurant that every neighborhood needs. It’s not the best at any particular entree, but it does just about everything extraordinarily well and it’s very consistent. It’s the Lauro of NW Portland. We tried Serratto for the first time in years, hosting a guest from out of town. Very mediocre in service and food. Pastini has better pasta dishes. I know that this review was froma while back, but on their website now it say thet they serve “authentic and innovative dishes from Italy, France and the greater Mediterranean region”. So perhaps that would alleviate some of the confusion. I plan on eating there this weekend so will give a full update when I return. That would be great. I know they have changed chefs several times. I plan to go back myself in the next week or so. Took some out of town guests there Friday night. Service obliging but s.l.o.w. Cocktails were excellent. No amuse-bouche in sight, food mediocre. That dungeness crab/marscapone ravioli may as well have been stuffed with newspaper and paste. Beet salad okay, caesar pretty good, scallops pretty good. Desserts (creme brulee, chocolate cake) were v.good but the lemon sorbetto was so incredibly sour it was inedible. The mandarin orange/clove was excellent, however. All in all, a lovely place with disappointing food. Really makes me miss Delphina’s even more.